This road blue knit gamer by CCM was worn by Denis Potvin during the 1985-86 NHL season. The New York Islanders selected Potvin with the 1st overall pick in the 1973 NHL Amateur Draft. He began his career on Long Island in 1973-74 and won the Calder Trophy as the NHL’s Rookie of the Year in the spring of 1974. 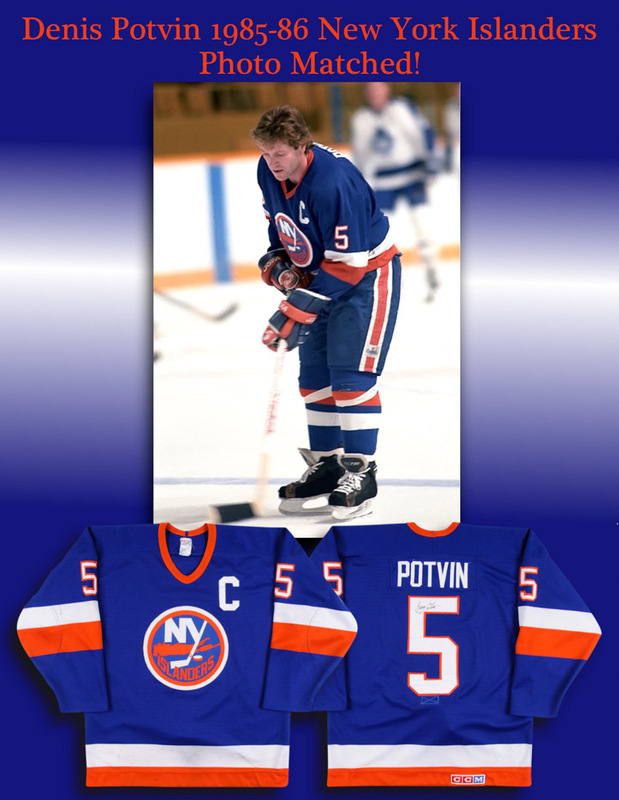 Potvin spent his entire 15-year NHL career as a member of the Islanders. During that time he played in 1060 games and scored 310 goals and 1052 points. His playoff totals are no less impressive with 164 points in 185 games played. Potvin recorded 3 different 30-Goal seasons and also eclipsed the 100-point mark during his illustrious career. Denis is considered one of the NHL’s all-time great defenseman. He won 3 Norris Trophies from 1976 thru 1979 and retired as the NHL’s all-time leader in goals, assists and points among defenseman, both in the regular season and playoffs. Denis was a 7-time 1st or 2nd Team NHL All Star who appeared in 9 NHL All Star Games. 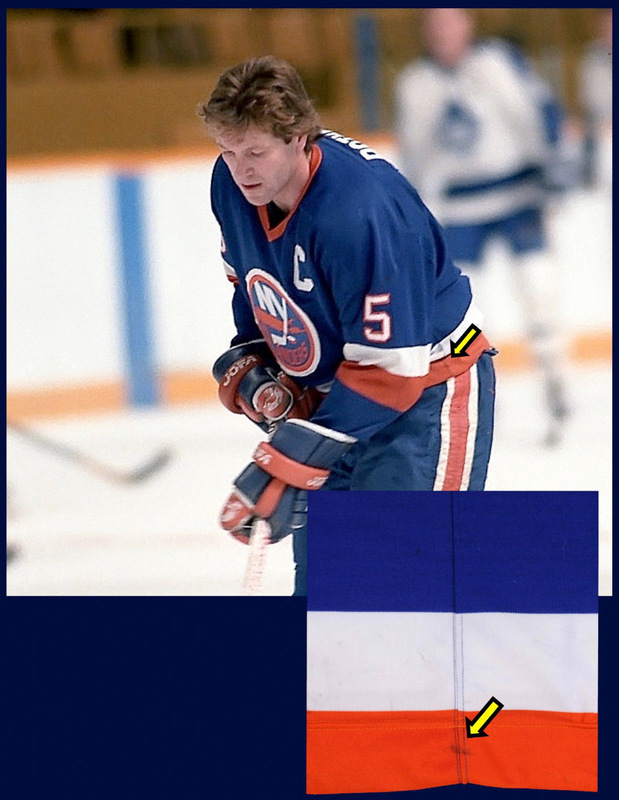 Potvin became the Captain of the Islanders in 1979-80 and immediately thereafter led the team to 5 consecutive Stanley Cup Finals, hoisting the Cup 4 straight times from 1980-83 and earning dynasty status in the process. Internationally, Potvin represented Team Canada in the 1976 and 1981 Canada Cups. Proudly sewn to the left breast of this gamer is the Captain’s “C”. Sewn into the collar is the born on date “85-01”. The game wear on this size 50 sweater is solid and consists of stick and slash marks, board burns, un-repaired burn holes, stitch pops, heavy collar pilling and fine inner pilling. 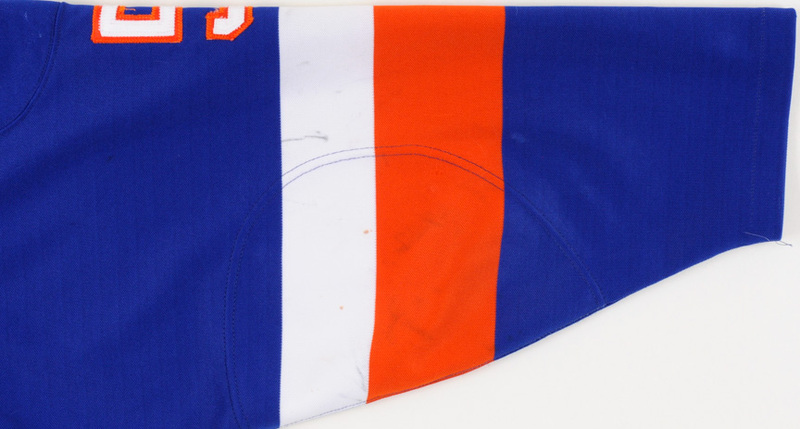 A custom fight strap is sewn to the inside just beneath the back player number. Shown above is a beautiful photo match of Potvin wearing this exact jersey during the 1985-86 season. 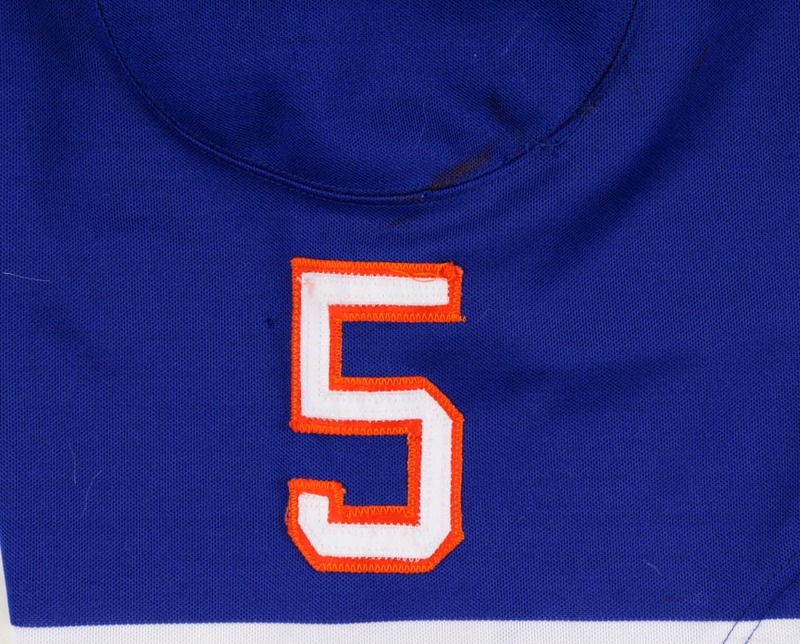 This set marked the first time in Islanders team history that they wore a solid knit jersey. 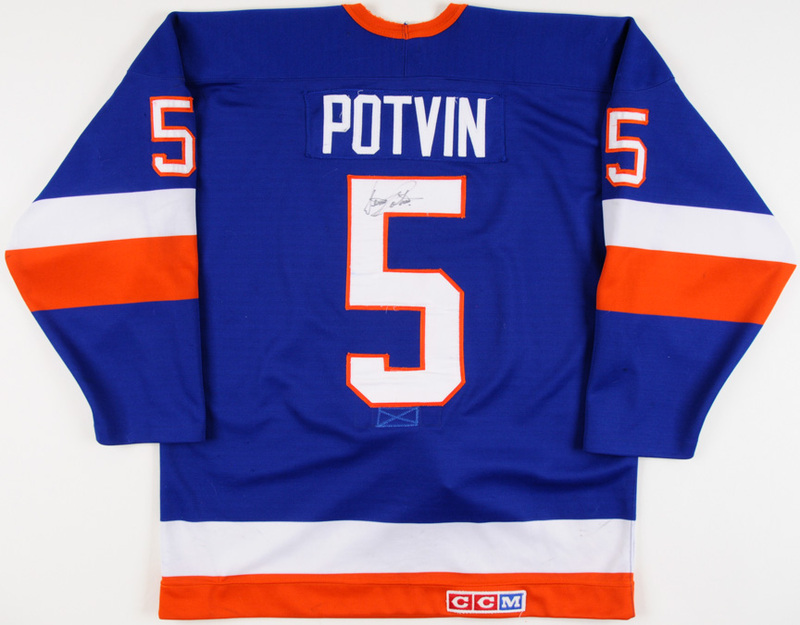 On the back player number is a black sharpie signature in Potvin’s own hand. Despite being towards the later part of his illustrious career, Potvin lit the lamp 21 times and scored 59 points in 74 games played in what turned out to be the last of nine different twenty goal seasons. A well-worn photo matched example that sports the prestigious letter of honor and was worn by one of the greatest defenseman in NHL history, choice!